OIT is a diverse organization, responsible for many campus services. This is the first in a series of articles highlighting OIT activities you may not be aware of. When anyone “calls UCI,” they reach the campus operator, who cheerfully answers questions, gives directions, or figures out the person or department the caller needs. 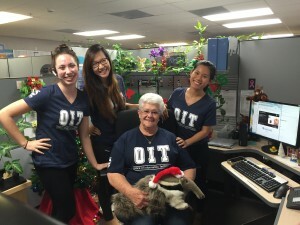 Led by Gayle Bonham, the operator staff includes a group of bright and friendly students ensuring callers to UCI have a good impression of the campus. If you need help reaching someone at UCI by phone, call 824-5011, and Gayle or her “angels” will direct you to the right place. ReadyTalk is a telephone/web conference service used throughout the UC system. All UCI campus departments are eligible to sign up for service. ReadyTalk adds new features as they become available. In the last few months, the following capabilities have been added. Conference participants can access a web conference via their iPad. Users can easily create and distribute a press release about an upcoming webinar. ReadyTalk enables users to email a custom survey to participants after a webinar. With video clip playback you can easily upload and stream short video clips to your entire audience providing a rich web conferencing experience. Guides on how to use these new features can be found on the ReadyTalk web site. ReadyTalk, one of UCI’s conference calling solutions, has a new feature. QuickLauncher is ReadyTalk software you can install on your Windows or Macintosh computer to facilitate the creation and management of telephone and/or web-based conference calls. Start and Join ReadyTalk Web Meetings with a single click. Start an Audio Meeting by having the audio bridge dial you into your meeting. Launch ReadyTalk’s full service Conference Center to manage your scheduled meetings. OIT has published general information on ReadyTalk conferencing online. ReadyTalk’s Getting Started page includes reference cards, training videos, and links for downloading QuickLauncher. Three years ago, NACS (now part of OIT) began an intensive process of exploring alternatives, as Infomail was no longer supported by its vendor, and spare parts to keep the system running were already scarce. At the same time, voice mail technology was evolving, and NACS wanted to keep open the possibility of providing new functionality made available through modern technology. Other criteria included the ability to emulate Infomail to minimize the impact on users, and security features to counter the rise in phone-mediated identity theft and other forms of fraud. Once the Voice Mail system was selected as the best match to our diverse needs, NACS began a long process of working with the vendor to develop and test special purpose software so that the Voice Mail system could emulate Infomail. This project was quite successful, and only a few differences between Infomail and Voice Mail remain. OIT plans to enrich the Voice Mail service over time with new features. Already users are able to do some things not possible with Infomail, such as using a simple menu to configure your Voice Mail greeting to indicate why you are not in the office (e.g. vacation) and when you expect to return, rather than dictating a custom message for each absence. 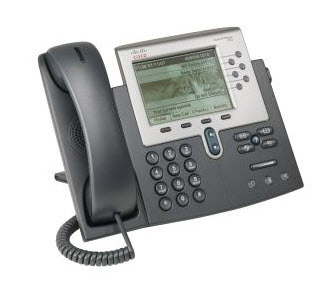 More information on the new Voice Mail service is on line: a FAQ, and PDF documents offering a basic Users Guide, a navigation map, and a hierarchical description of Voice Mail features. Faculty and staff now have a powerful new tool for finding contacts through UCI’s online phone directory. PSearch melds the directory data NACS maintains with state-of-the-art database research from the lab of ICS Professor Chen Li. PSearch represents a collaboration between NACS and ICS. Professor Li’s team offered the intelligent database search technology, and NACS offered the data and our user-interface experience. Key contributors on Professor Li’s team include PhD student Rares Vernica at UCI and Guoliang Li, a visiting researcher from Tsinghua University, China. PSearch is only one potential use of Dr. Li’s “type-ahead search” technology featured on his TASTIER project web page. Future uses may involve other campus-wide or even UC-wide data sets. This new technology makes it possible to simultaneously support full-text (google), quick-link, and directory searches in a single query as exhibited by the search box on the ICS home page.